Are you a sound engineer? Do you hate taxes? I’m not an expert and I make mistakes every year. In fact, this year I accidentally submitted erroneous information, so now I’m waiting for my 2013 return to get kicked back to me so I can submit it again. Hooray. Don’t do what I did. Use TurboTax to make the process easier on yourself. Follow these tips gained through many mistakes (and talking to Stephen Fishman) and save yourself some pain. #1 Collect your income and expenses. I keep track of this stuff all year long using the iExpensit iPhone app. I like it because it’s always with me and I don’t have to worry about holding on to receipts, even for cash, because the app stores a photo of each receipt for me. I used to try to enter everything into a spreadsheet at the end of each day, but I never managed to make it a habit and it was easy to forget things after the fact. Recording it at the time of transaction is best. At the end of the year I also usually go back and scan through my bank statement to see if I’ve missed anything. In iExpensit you can export a report to Excel or a similar program. Organize your data by deleting columns you don’t need, separating expenses from income, and ordering everything by category. Some of you may be completely independent sound engineers, but I am also a part-time employee at a couple of music venues. In my case, I must separate my income out between what I earn as a freelancer and what I earn as an employee. #3 Choose TurboTax Home & Business. Plan on taking the home office deduction. If you are a full-time employee at a theatre or venue and are only receiving W-2 forms, you should be fine with Deluxe. Still unsure? Use this handy reference. #4 Input business income and deductions. 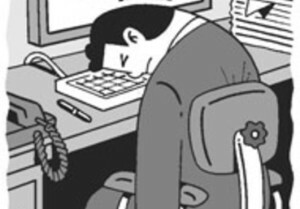 You’ll enter all of your 1099-MISC forms and income as a freelancer in the business section. Anyone who paid you $600 or more last year must send you a 1099 (and file a copy with the IRS) by January 31. Everything else is on you to report. I know some people keep the money they made in cash off the books, but I report everything. I’m pretty sure the taxes I’m paying now are completely worth avoiding the headache of a messy audit down the road. I’ve never experienced one, but I’ve heard they can be terrible and drag on for months. TurboTax does a pretty good job of guiding you on where to put what deductions. Anything they can’t categorize goes in the miscellaneous section at the bottom, including the money you paid for TurboTax last year. As you go through each section entering your deductions, make sure to mark them in your spreadsheet so that you don’t accidentally add them twice. I keep track of this by changing the background color of a row I’ve already used. At the end, as you can see in the image above, my spreadsheet looks like a pastel Christmas tree. I know this is time consuming, but if your marginal tax bracket is 25% (income from $36,250 to $87,850), you will save twenty-five cents in income taxes for every dollar you can claim as a deductible business expense. 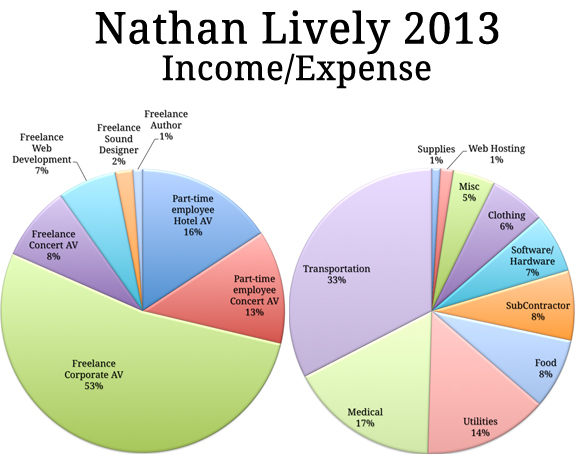 Here is an overview of my income and expenses for 2013. #5 Input personal income and deductions. This is where you put in your W-2 forms if you were an employee last year, and deduct medical expenses. I usually don’t have much else for this section. One year I made less than $14,590 and could apply the Earned Income Tax Credit of $487. I hope none of you have to use that one, but it does happen. Every year my returns create some kind of error. This year it was because I moved home offices and entered some numbers wrong. I got on the chat support and the TurboTax rep offered to call me up. He was nice and waited on the phone while I got it sorted out. Now I definitely feel like I got my money’s worth. You’ll have a few different options for paying your taxes. I definitely recommend the automatic deduction from your bank account on April 15th. Don’t make yourself try to remember to send a check. Or, if you have the money now, pay it now. One year I couldn’t afford the full amount and I requested to pay in installments. It was pretty easy. There is a service charge, but it was worth it. You can only do this once every five years, though. #6 What if I make a mistake? Sorry, you’re fucked. Well, at least temporarily. E-filing your tax return is like dropping it in the mailbox. You can’t get it back. If the IRS rejects your return, then you can make changes and resubmit it. If they accept it, then the only way to make a change is by submitting an amended return by mail — no e-filing for you…I mean me. Yeah, I did that this year. Accidentally used a 1099 form from 2012 instead of 2013. Fail. Fortunately, it’s not hard to create an amended return with TurboTax and fix mistakes. Then you just print it out and mail it in. Since I scheduled my original payment with bank transfer on April 15th, I assume the IRS will send me a refund after that date. I’ll update this post when I know for sure. What are your personal TurboTax tips? Comment below.